Congrats on taking the October Unprocessed challenge! Revamping your diet is no easy task, but rest assured it does get easier over time and eventually even becomes your “new normal.” And I am speaking from experience. In May of 2010, our family decided to take a little challenge of our own. We went from being a typical suburban family that made our sandwiches on white bread, ate highly processed treats after almost every meal, regularly purchased that blue box macaroni, had never before shopped at the farmers market, and had never bought anything that was organic (at least not on purpose) to a family that decided to take a “100 Days of Real Food” pledge. For 100 solid days the four of us avoided all refined grains (including white flour), all refined sweeteners (including white sugar! ), and anything out of a package with more than five ingredients. We took this pledge to draw attention to how much Americans have come to depend on highly processed food and here we are more than two years later still going strong. The pledge ended up being a life-changing experience for me personally, and knowing what I know now…I could never go back to the way things used to be! I am thrilled that there are others, like Andrew, on our very same mission. And I am so glad he’s invited all of you to join us! To add to Andrew’s long list of amazing resources that he’s pulled together for this year’s October Unprocessed I’d like to share my homemade “Larabar” recipes with you below. Good luck with your transition to real food! 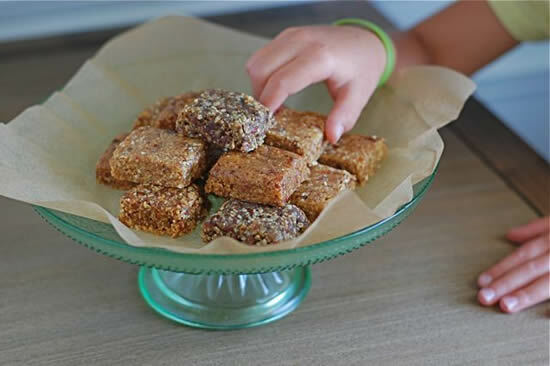 These scrumptious bars come in to save any craving you have and will definitely live up to their competition. Combine all ingredients in a food processor and puree until mixture starts to stick together. Remove date mixture and squeeze together into one big clump with your hands. Mash it down on a cutting board or sheet of wax paper to form into one even rectangle shape using the sides of your hands (or a knife) to make the edges straight. Slice into 12 even squares. For best results store in the fridge, although bars can be kept at room temperature. 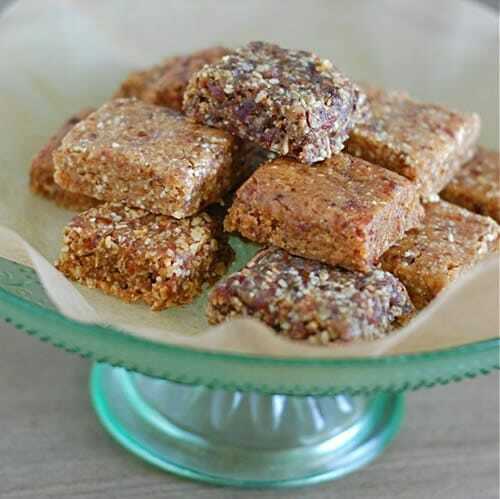 These incredibly tasting squares are sure to satisfy and sweet need you crave. Slice into 8 even squares. For best results store in the fridge, although bars can be kept at room temperature. These tasty treats don't stop there, as there is a nut free option that competes with, if not better than, its counterparts. Combine seeds with olive oil and salt and mix together thoroughly. Toast coated seeds in toaster oven, a pan on the stove (on low heat), or standard oven on 350 degrees F until slightly brown. Combine toasted seeds, dates and water in a food processor and puree until mixture starts to stick together. These delectable snack bring happiness to craves of all sorts, especially those who love a soothing, guilty free peanut butter snack. Love the recipes. Thanks for sharing. I’m with you, Lisa. When this challenge is over, I’m not going back! Thanks for the recipes! Thank you so much for sharing these! I am getting ready to do a long long long backpacking trip, and I was trying to find some home-made recipes for bars. Can’t wait to try these! Thanks for not one, not two, but four awesome recipes! Your site is a true inspiration! Tried to make the cashew Larabars today. Don’t know what I did wrong but mixture was too sticky to even smooth out. So, instead I rolled it out into small balls and put in refridgerator. (Didn’t want to waste all the ingredients I used). They taste great…just like the store-bought ones! Any ideas what I did wrong? Mixed too long? Added too much water? Homemade lara bars are kinda sticky- I always roll them into balls- I love the size of just a couple bites. You should add water just a few drops at a time- that might help. If you use a piece of wax paper like she suggested it can be easier to press them down. Putting wax paper above and below the bar while you make it into the desired shape will help. Or getting your hands wet first. Glad you could salvage them!